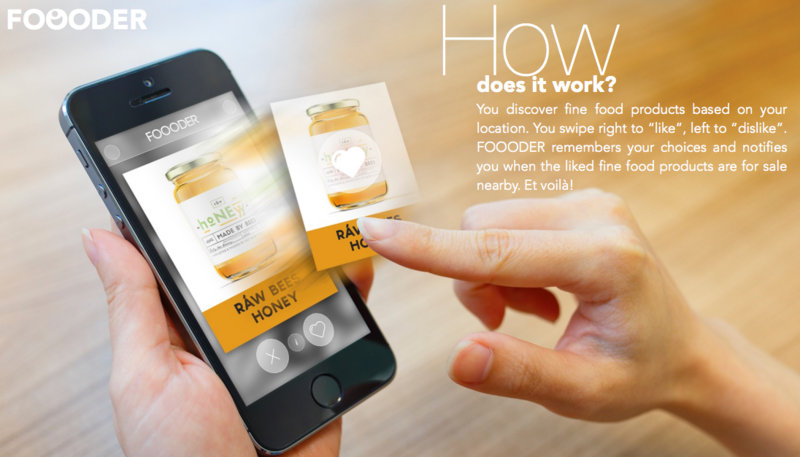 FOOODER is a mobile app similar to TINDER, but for fine food products. Mobile app users discover fine food products nearby their location. They swipe right to “like”, left to “dislike”, based on photos, product information (including price, place (location of fine food retailers), promotion (if any), but also suppliers). The (dis)like indicates the users’ interest in the specific product based on the image and information provided. In addition it might occur that the user tried one of these products before – however due to their local / artisanal character these specific products most likely have been consumed once or on a sporadic occasion, and often have not been integrated in the users “shopping list” (i.e. not a product a product they consider buying on a regular basis due to its relative scarce availability). FOOODER notifies them when the liked fine food products are for sale nearby. Fine food processors and fine food retailers promote their fine food products directly to mobile app users. As such, FOOODER delivers a solution for mo-bile app users for product discovery and it contributes to informed choices. FOOODER is a laureate of the Future Internet Accelerator for Food, Perishables and Logistics (FInish). The TINDERlike card-swiping interface offers advantages from cognitive evaluation process of one decision; fast decision-making (release true sense for the product); very easy to use interface for all audiences. Further, given the fact that FOOODER notifies mobile app users when the liked fine food products are for sale nearby it reduces searching costs. However, because these notifications are done based on mobile app users’ preferences, they will not feel like fine food processors and fine food retailers stalk them. Besides, fine food processors and fine food retailers can be informed about the “likes” (consumer data on demographics and product preferences) and as such, could tailor their effort to a specific target audience better. In order to illustrate, let’s assume a user has marked an item as interesting (liked) and later has actually bought and tasted a food item. In such cases the measure of success (i.e. increased sail / consumption of specific products) shall be followed up on the distributor / retail side – this by comparing the average volume before placement in the FOOODER app versus an average post-placement. For full clarity, it is not the goal of this app to incite users to return to a specific product and confirm their consumption of specific product. Rather, we position ourselves as a partner of the producers; processors and fine food retailers and intend work closely together – by sharing data and statis-tics on the products presented in FOOOODER.